If your garden has a sloping shape, there are several challenges to designing it in a way that will maximise its potential. Fear not, however; a sloped garden can look very beautiful – and natural – if you follow a few simple rules of hardscaping and planting. Garden expert Matt James offers his advice on making the most of your sloping garden. When you're done reading, find out how to plan, design and cost your garden transformation. Thought your sloping garden was a disadvantage? In fact, it can present some unique design opportunities. Terracing (see below), separated by retaining walls, gives you the perfect opportunity to introduce defined zones within a garden: create a child-friendly garden on one; plan a kitchen garden on another; make room for outdoor dining or living spaces on others. Sloping gardens are perfect for water features, whether garden-length streams or waterfalls or spouts projecting from retaining walls into a pond or sump below. Steep downhill slopes give you the ideal opportunity to hide features you'd rather not see, such as sheds, while steep uphill slopes allow you to show off a summerhouse or pergola. Good drainage is essential so that your patio doesn't become submersed every time it rains. Ensure your builder has a made provision for drainage of retaining walls (weep holes), and for the patio itself, particularly if it is surrounded by retaining walls rather than borders the water can run off into. Designing your sloping garden so that the end of it is visible from your patio will mean that, even if you don't wander that far in winter, you can still appreciate the view. Use retaining walls as a decorative feature overlooking the patio. So, instead of one very high retaining wall leading down or up to the next level, building two or three stepped walls will allow you to create terraced planting between levels. It will use up more lateral space, but will look more attractive, and be safer for young children. Consider your retaining walls' materials: brick; natural stone; sleepers; telegraph poles; log palisade; and concrete block to be rendered and painted are all options, but ideally should be sympathetic to the rest of your home's architecture. If the cost of digging out a decent-sized patio next to the house is beyond your budget, use the area for attractive terraced planting with steps leading to a patio nearby. More advice on creating the perfect patio. Manipulating a gentle slope to produce level terraces isn’t difficult – you can usually cut and fill by hand using a spade. First, cut the soil out of the slope using a large spade to create the first level. Then, use the loose soil that you’ve just cut out to make the next identical sized level terrace, and so on. Never just pile soil against a timber fence – it will rot and warp quickly. Instead, you will need to invest in retaining boundary walls. Terracing a steep slope, especially one that‘s made artificially, isn’t a job to tackle yourself. On steep or unstable slopes you’ll probably need earth-moving equipment and extensive foundations plus whatever ‘face’ material you want to see, whether it’s bricks, rendered blocks, sleepers or gabion mesh cages. If the slope is gradual, levelling can be achieved with timber retainers, such as sleepers. Calculate your levels carefully as, if they are built up too much, you might find that you'll have a clear view down into neighbouring gardens – which they may not welcome. If it's unavoidable, take measures to improve privacy in your garden. Call in a professional garden designer, or a landscape construction company, to be on the safe side. We have lots of useful tips on how to employ a garden designer. Bear in mind that terracing a sloping garden in its entirety will be expensive – taking away or adding soil in large quantities, and building retaining walls is costly. 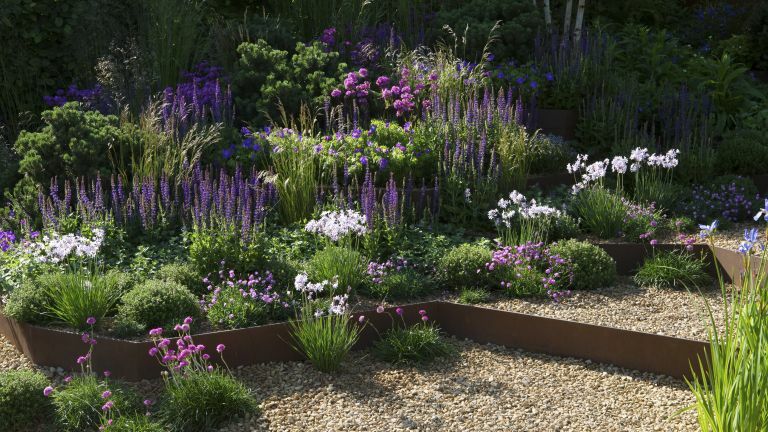 So, work towards cutting and filling instead; if your garden's slope is gentle in places, you can save money by terracing just sections of it and leaving the gentler slopes as they are. If you’re on a tight budget, you can create terraces with timber decking and wooden walkways. Retaining walls are an invasive solution and involve a lot of specialist work, which is expensive. With decking, extensive foundations aren’t needed as the whole structure is built above the slope rather than cutting into it. You can install decking yourself if it's a simple structure that's needed; be inspired by these amazing decking ideas to get started. Steps are a key design feature on most slopes and the most common way of getting from A to B. Outdoor steps are very different from indoor ones, as they should be deeper and wider. As a guide, the riser (the vertical face) should be no higher than 15 to 20cm. The tread (the flat part you stand on) should be a minimum of 30cm, and the tread can be as deep as you like. For long slopes, 2m deep treads (essentially a series of platforms) aren’t uncommon. In a small garden, curving the steps or building them across the garden will take up less space. Ramps are a simple-to-navigate option in a sloped garden, but they need a lot more room to accommodate them, plus they can dominate small spaces. If, however, access is required for a wheelchair user, there is no other choice. A 1:12 ramp is the minimum for wheelchair users to navigate comfortably. This means that for every 12m travelled there will be a change in level of 1m. Many garden designers aim for a shallower ramp of 1:20 if it can be fitted in. High retaining walls and raised decks should be carefully designed with safety in mind – with rails or tall planting preventing anyone, particularly young children, toppling off them; steps and ramps can be slippery in wet or frosty weather, too, so consider handrails, particularly if an elderly person uses the garden regularly. Retaining walls and raised decks over a certain height must have railings anyway to comply with building regulations. Never leave bare soil unplanted – plant up the slope immediately, even with something temporary like annual bedding. Grow eye-catching mixed plantings, wildflower meadow seed, or even just plain grass seed. Plants absorb heavy downpours and the roots help to bind the soil on the slope together. Bare soil erodes fast during heavy rain and washes quickly down to the bottom. Find out more about how to choose plants for your garden.